One of the most ambitious legacies of the 20th century was the universal commitment to ensure freedom from want as a human right. But to what extent are countries across the world living up to this commitment? Find out in Prof. Randolph’s new book with Sakiko Fukuda-Parr and Terra Lawson-Remer, Fulfilling Social and Economic Rights (New York: Oxford University Press, 2015). 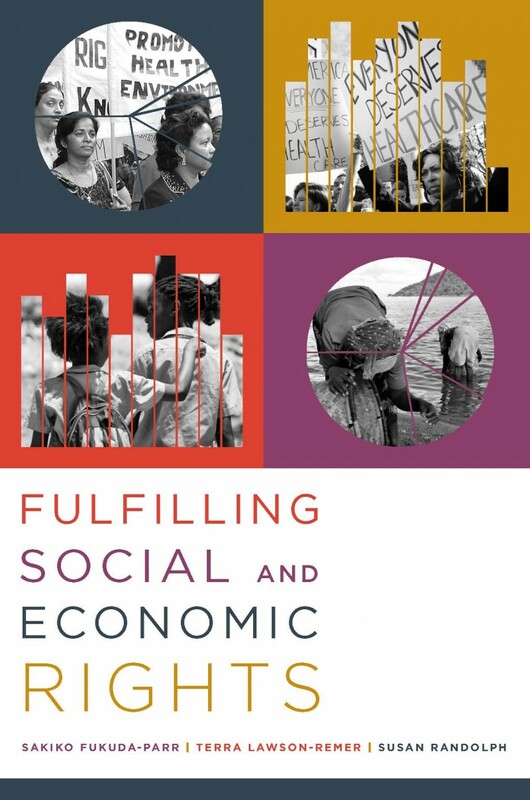 Fulfilling Social and Economic Rights develops an innovative evidence-based index for comparing performance on education, food, health, work and housing across very differently situated countries over time and explores the factors influencing performance. In doing so, it provides empirical evidence to resolve some longstanding controversies over the principle of “progressive realization” and advances our knowledge about the status of and factors promoting social and economic rights fulfillment in the 21st century. One of Connecticut’s National Public Radio stations, WSHU, launched a program Thursday November 28th called the “State of Disparity.” The program focuses on inequality in Connecticut. The research of Professor Susan Randolph, Emeritus Professor William Lott, and Ph.D. candidate Patrick Flaherty provided background information for the program, some of which was published in The Connecticut Economy. Both Professor Randolph and Patrick Flaherty and were interviewed by Craig LeMoult. The launch of the program along with some sound clips from the interview can be heard on Morning Edition (See November 28th entry) can be found at the website devoted to the program: http://www.stateofdisparity.org/ . Click below to see the two articles from The Connecticut Economy that provided background to the program. What Drives Income Inequality Among Connecticut’s Families? Nutmeg Haves and Have Nots: How Wide the Divide? Professor Randolph is featured in an article on the homepage of UConn Today. You can read more about her work evaluating economic and human rights here. Professor Susan Randolph and a small group of scholars worked together to create a new SERF index to measure human rights, which has recently generated media coverage. For more information, please see: http://www.csmonitor.com/World/Making-a-difference/Change-Agent/2011/0606/A-new-way-to-measure-human-rights-may-revolutionize-global-advocacy . The new index is expected to be used internationally as a barometer for measuring social and economic rights within a country. The Economic & Social Rights Research Group (ESRG) of the UConn Human Rights Institute will be hosting its annual workshop this Saturday. This year’s theme is to investigate the status of each economic right. Lead by Prof. Minkler as well as Prof. Hertel from Political Sciences, the members of the group and its associates will meet in Room 304B of the Student Union all day with an agenda comprising 18 presentation. The department contributes three, with Prof. Randolph on the right to food, Adjunct Prof. Derek Johnson on the right to education and Prof. Zimmermann on the right to social security. Today the challenge of economic and social rights fulfillment has never been more pressing. Despite global growth and rising per capita GDP, malnutrition, deaths from preventable disease and other forms of socioeconomic exclusion remain endemic: in 2010, the worst performing countries met less than 40% of their economic and social rights obligations. Countries are bound under international law to respect, protect, and fulfill economic and social rights—but there are few viable tools to hold States accountable for meeting these human rights obligations. We are therefore pleased to announce the launch of a new website and online database for the Economic & Social Rights Empowerment Initiative. At the core of the Initiative is the Index of Social and Economic Rights Fulfillment (SERF Index), which allows rigorous analysis regarding economic and social rights guaranteed under international law: the right to adequate food, right to education, the right to the highest attainable standard of health, the right to adequate housing, the right to decent work, and the right to social security. SERF Index innovations permit cross-country comparisons in rights fulfillment, and objective assessment of whether the situation in a country is improving or deteriorating; consider countries’ available resources in determining rights obligations, as required by the legal principle of progressive realization; and provide a methodology to examine disparities in rights fulfillment between population sub-groups. These innovations create a powerful tool for civil society to hold governments accountable for fulfilling rights guaranteed under international law. Please visit www.serfindex.org to learn more about the Initiative, access SERF Index cross-country data, and read associated research papers. The Economic & Social Rights Empowerment Initiative is a project initiated jointly by Prof. Susan Randolph at the University of Connecticut and her collaborators at the New School, Sakiko Fukuda-Parr and Terra Lawson-Remer, and is undertaken collaboratively with the Social Science Research Council. Prof. Susan Randolph has been informed that her NSF Grant Proposal, “Economic and Social Rights: Obstacle to Growth or Handmaiden of Growth?” has been rated “highest priority” and will be funded pending final approvals. Sakiko Fukuda-Parr and Terra Lawson-Remer both at New School are co-PIs on the grant. The grant request is for $233,000 and will be implemented over three years. The abstract of the grant appears below. Countries are bound under international law to respect, protect, and fulfill the economic and social rights of their citizens. The International Covenant on Economic, Social, and Cultural Rights (ICESCR) legally obligates countries to fulfill the rights enumerated therein to the maximum of available resources. This translates to an obligation of progressive realization—under which the level of obligation on each country differs according to its resource capacity, but all must move as expeditiously and effectively as possible towards rights fulfillment. In the face of the progressive realization standard, measuring the extent to which countries meet their economic and human rights obligations has posed a challenge to scholars, human rights advocates, and the treaty monitoring body of the ICESCR. A central component of this project is the refinement and consolidation of an annual and longitudinal international social and economics rights fulfillment index (SERF Index) that for the first time makes the standard of progressive realization operational. The second component of this project utilizes the SERF Index to address three empirical questions. First, is there a trade-off between meeting economic and social rights obligations and economic growth? Second, do some policies simultaneously foster the fulfillment of economic and social rights obligations and economic growth? Third, to what extent does a government’s success (or failure) to meet obligations under the ICESCR depend on direct ESR expenditures, the ability to raise revenues, and the interplay between the two? Cross-sectional and time-series econometric techniques are used to address the first two questions, while case studies are used to address the third. As a whole, the project will promote greater understanding of the policies that promote economic and social rights, conflicts and synergies between those policies and other goals, and the political economy dynamics inducing countries to meet or shirk their obligations under the ICESCR. The project also develops and makes publicly accessible a rigorous assessment tool—the SERF Index—for use by scholars, human rights advocates, and UN Treaty bodies alike.